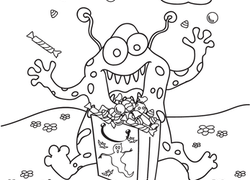 Kids can practise their counting skills by completing this Halloween dot-to-dot ghost. They'll also give their fine motor skills a boost as they work. Have you ever seen a house as spooky as this one? 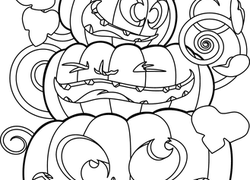 Enjoy some creepy coloring with this haunted house coloring page. This friendly Halloween witch is taking a nighttime ride through the city. Can your child brighten up her evening with some colour? Get all your little Halloween monsters ready for memorizing! This memory match-up game will help improve memorization skills in a fun way. 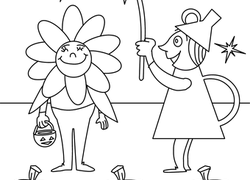 Kids have a great time coloring this cute Halloween scene.